Send your details to the travel advisors at Lost World Adventures for more information about this trip. Experience the absolute highlights of Ecuador, the small Andean nation that packs a hefty punch with its immense biodiversity and fascinating history. 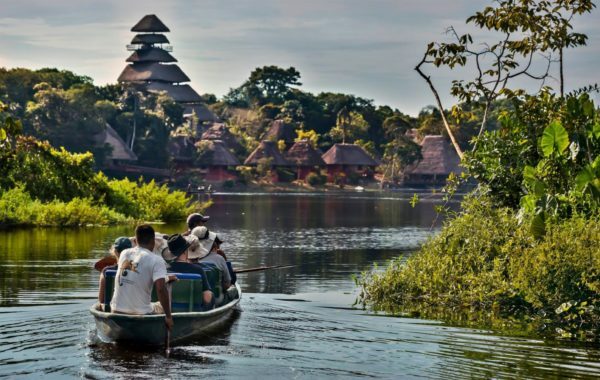 This action-packed odyssey begins in the historical capital city of Quito before embarking on a cruise of the world-famous Galapagos Islands and, finally, a true adventure deep into the heart of the Amazon rainforest. This itinerary and all hotels, days or excursions can be customised on request. A Lost World Adventures advisor will be happy to help – get in touch for more information. Use the following itinerary for inspiration. Remember: all days, hotels and activities can be altered to suit your requirements. A Lost World Adventures travel expert will be happy to advise. You'll be met at Quito airport by Lost World Adventures' local guide and transferred by private vehicle to Hotel Patio Andaluz, located in the heart of historic old Quito. This charming boutique hotel is a historic National Treasure and offers exceptional service with plenty of colonial-era charm. On day two you'll set off with a private guide for a drive around Quito, one of the most charming cities in Latin America. Declared a "Patrimony of Humanity" by the UNESCO, the colonial centre is home to Independence Square, the Presidential Palace, the Cathedral, the richest church of the Americas - La Compañia (dating from 1605) with its breathtaking golden altars, The San Francisco Square and Church and the arts and crafts gallery of Tianguez. Around midday the tour continues to the slopes of Pichincha Volcano. From here you'll board the “teleferico” (cable car) that climbs to 13,200 ft (4,000 m) above sea level. From the lookout you will have magnificent view of the city and, on a clear day, some of the volcanoes and snow-capped mountains surrounding the capital. Keen hikers, with special permission (organised on request), can hike up to 14,800 ft for yet more impressive views. Late afternoon you'll return to your hotel to relax and enjoy the city. Your guide will be happy to recommend one of the city's excellent restaurants. 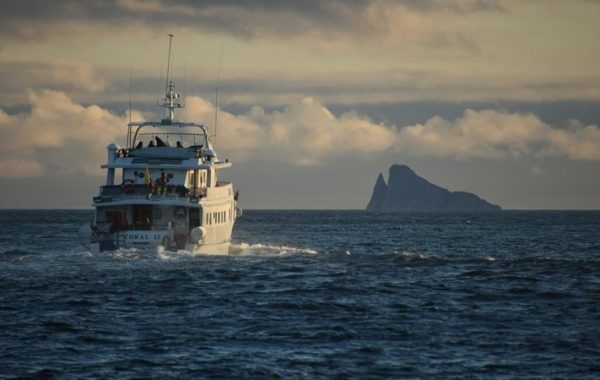 After breakfast on the third morning you'll be collected at your hotel for the short flight to Baltra airport in the world-renowned Galapagos Islands. You'll board either the M/Y Coral or the Coral II, greeted with a welcome cocktail, shown to your berth and given an orientation of the yacht and the on-board facilities. The Corals are intimate cruising yachts, thoughtfully-designed to create a private yacht experience in cosy ambience. The restaurant serves delicious Ecuadorian and international cuisine even extending to a BBQ dinner on the open-air Moon Deck. From here begins a four-day cruise of the islands, with twice-daily shore excursions accompanied by expert nature guides. You'll see giant land tortoises, the finches that made Charles Darwin famous, countless sea birds, land iguanas, and much more. You'll enjoy easy-going hikes, shore landings, snorkelling and kayaking by day, and spend four pleasant evenings on the yacht with its on-board jacuzzi, freshly-prepared cuisine, and stargazing deck. Returning to Baltra airport, you'll take a connecting flight back to the mainland, arriving at Coca in the Amazon basin where your adventure continues. You'll embark a motorboat for a two-hour river journey deep into the Amazon, eventually arriving to Napo Wildlife Centre, one of Ecuador's preeminent luxury ecolodges. You'll be greeted at the dock and shown to your private, luxury cabana which includes a king-size and twin-size bed with mosquito netting, private bathroom with hot water, a multi-speed ceiling fan and private porches providing lake and forest views. The lodge has 24-hour electricity provided by hybrid system combining solar panels, batteries and silent generators. From here you'll enjoy another four days of thrilling excursions, lead by expert guides with intimate knowledge of the jungle. Excursions include a visit to the local clay lick, a colourful meeting point for countless parrots, parakeets and macaws; ascending a 125 foot canopy observation tower to explore the rainforest from the perspective of the spider monkeys; easy-going hikes through the forest to meet local indigenous communities; canoeing trips to explore the river; and much more. At night you'll relax in the lodge and enjoy some exceptional cuisine freshly-prepared from local ingredients. After four thrilling days it's time to leave the rainforest and you'll be collected for the journey back to Coca and the flight to Quito for your onward connection. From here you can continue to explore Ecuador, or make the short connection to Peru! Contact a Lost World Adventures travel advisor who will be happy to customise this itinerary. Thank you Lost World Adventures for being so patient and putting so much time and effort into creating a trip for us...You have gone above and beyond to accommodate us and hopefully we will do this trip (or another one) in the future. I am so glad that we connected and we will hopefully be in touch in the future! The trip to Ecuador and the Galapagos was spectacular. The trip to the Galapagos went extremely well. The service in Quito and aboard the Eclipse was exceptional. The care and service on the boat were exemplary. Lost World Adventures was very attentive and professional in all communications. Your attention and consideration are appreciated. Four nights aboard the M/Y Coral or Coral II Galapagos yacht. 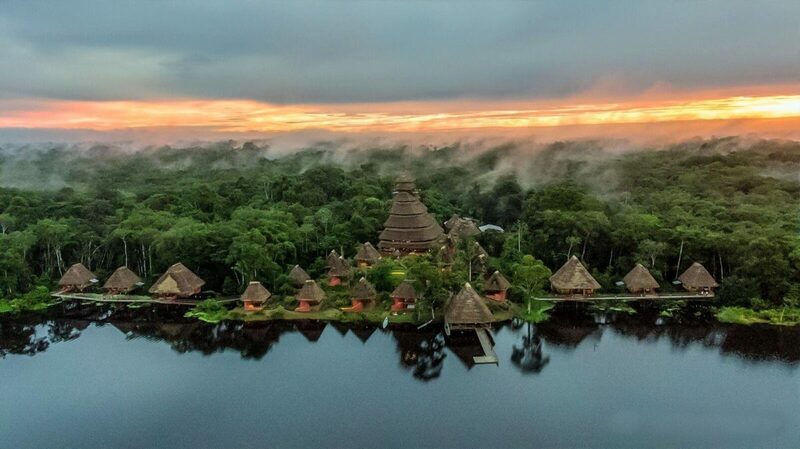 Four nights in a private cabana at Napo Wildlife Center and Amazon Lodge, Ecuador's best ecolodge. Two nights at Hotel Patio Andaluz, in Quito's historic old town. Twice-daily excursions at the Galapagos and Amazon, guided by an expert nature guide. Private, guided tours of Quito and surroundings. All meals at the Galapagos and Amazon. All hotel breakfasts in Quito. All ground and hotel/airport transfers with private driver and comfortable vehicle. Flights are not included but can be arranged on request.